Cybele wins! She got it right on the money (she was savvy enough to follow her hunch and double-check here). 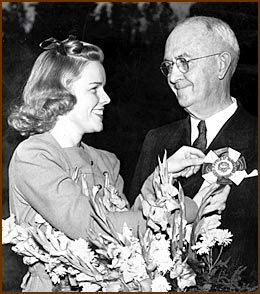 In the photo above, 1941 Rose Queen Sally Stanton pins E.O. Nay, who was grand marshal that year. He was the chairman of the Board of City Directors* at the time. He served as chairman longer than anyone else in Pasadena history -- from 1932 to 1941. He was proclaimed Pasadena's #1 citizen in 1938 when he was presented with the Arthur Noble Award. 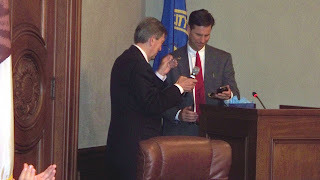 Three hundred fifty friends, including county and city officials, applauded the public-spirited man who has headed the municipal government for the past seven years as his boyhood friend, Judge Edwin F. Hahn, presented him with the burnished gold medal, signifying outstanding public service. 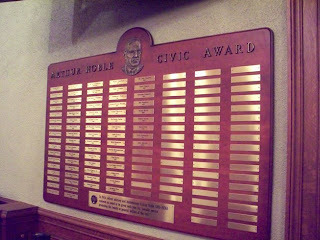 A huge plaque with the names of Arthur Noble Award winners hangs in the council chamber at Pasadena City Hall. In accepting the award he said, "I owe everything I am and expect to be to Pasadena. This city is very dear to me. I have watched it grow from a country cross-roads to a modern city. While I haven't acquired a great deal of worldly goods, I have acquired a wealth of friends, which are to me life's greatest treasure. What more could a city do for any man?" Born in Minneapolis, Edward Oscar Nay came to Pasadena with his family in 1884 when he was 11 years old and lived here the rest of his life. He was proprietor of a major plumbing and heating firm that he founded in 1896. He was first elected to the Board of City Directors in 1931 and again in 1933 and 1937. His civic leadership included serving on the committee that helped establish the Metropolitan Water District and pushing the Morris Dam project forward. His passing was felt greatly. Edward O. Nay, Pasadena's No. 1 citizen, chairman of the Board of City Directors for the past nine years, and grand marshal of the 1941 Tournament of Roses, is dead. The end came to the widely-esteemed man early yesterday morning while he slept at his home, 745 South Oakland Avenue. He was 68. ...It was during Mr. Nay's chairmanship that Pasadena became known as America's No. 1 city in "goodness of life." This point was brought out recently when a group of citizens urged through petitions that Mr. Nay run again this year for the office of city director. He had declined, at least partly because of ill health. Here is his photo on the wall in the inner sanctum. On Feb. 24 and 25, 1941, city flags were flown at half staff and municipal offices closed at 2:30 p.m.
* The Board of City Directors had previously been called the City Council, a name that would not be resurrected for another 50 years. ** In 1924, retired attorney and businessman Arthur Noble (1851-1936) endowed the award to be given for "notable service promoting the beauty or general welfare of the city." Today is Memorial Day, so I thought I'd post a couple of photos from Memorial Park. The park is located on Raymond Avenue between Holly and Walnut. 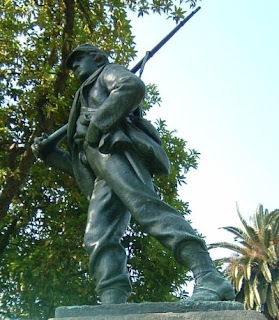 One of the most recognizable memorials at the park is this one dedicated to U.S. soldiers who fell during the Civil War. Other memorials at the park are dedicated to those who fell during the American Revolution and in Vietnam. Pasadena's World War II memorial is at Victory Park. Karin wins again! With her 8:16 a.m. answer of "first zeppelin ride over the arroyo," her guess was closest. In the photo above, Roy Knabenshue's airship Volunteer is set to take off circa 1913 in an open field at what is now the intersection of Marengo Street and Glenarm Avenue, near the Raymond Hotel (upper left). What's hidden from view in the photo above, due to all the people surrounding it, is the open-air gondola in which passengers rode. They needed more than cash to get on board; they needed courage! This airship's original name: Pasadena. The name change came after the popularity of Knabenshue's airship service dropped off as airplanes became more capable. He moved to Illinois in 1914, taking this airship with him to operate it at Chicago's White City Amusement Park. I just love the fact that the inflatable portion of these airships were called gas bags. What's that? You'd like to see it used in a sentence? "Knabenshue moved forward on his framework and tilted the front end down until the top of the gas bag presented an inclined plane to the force of the wind and the whip gradually settled down into the park as steadily as a steamer coming to the dock of a quiet harbor." They don't write 'em like that anymore! In 1905 Knabenshue was the first to make a dirigible balloon flight over the skyscrapers of New York, one year after his original flight at the St. Louis World's Fair. After several years of barnstorming and a stretch as general manager for the Wright Brothers, he came west in 1909 and in 1912 built the first airship service in America, taking people from Pasadena to Los Angeles, Santa Monica and Long Beach. Tournament Park was the location of New Year's Day events prior to the Rose Bowl Stadium being built and was also the site of several aviation milestones. Pasadena may become a permanent fixture on the aeronautic map. There is every prospect that Roy Knabenshue will become a resident of this city and conduct his airship experiments from this point. The matter has been taken up and a definite proposition will be made by the daring aerial navigator. 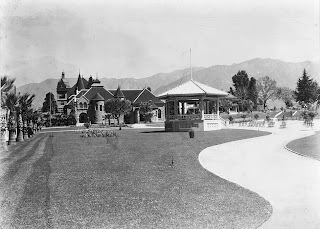 The proposition which Knabenshue may take up will be to make Pasadena his central station, to conduct his experiments here and in exchange it is stated, he will be given a home and lot in this city. 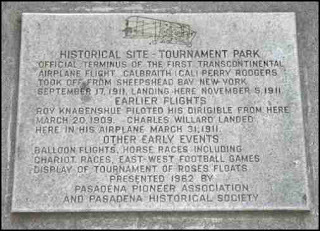 It is figured that with Knabenshue here attention will be directed to Pasadena as a place for aeronautic sports in both winter and summer time. As the daring sport is now in its infancy and wealthy men are contributing largely to the study of aerial navigation, it is believed that a great number of balloon and airship enthusiasts will be attracted to this part of the country to continue their experiments in winter, for there are a number of months in the eastern states when owning to the rigors of the winter climate, they are utterly incapacitated from pursuing their sports or experiments. Knabenshue passed away in 1960 in Arcadia. Karin came closest so I'm giving her the fabulous prize! She figured it had something to do with the 1918-1919 pandemic, and she was right. In the photo above, Pasadena Public Library staff don masks during the influenza pandemic of 1918-1919 that spread to 20 percent of the world's population and killed more than half a million people in the U.S. and 50 million worldwide. Some people have been freaking out about the Swine Flu lately, but it's nothing compared to this post-World War I pandemic. Here are some of those same library employees unmasked. They worked in the building located in what was known as Library Park (now Memorial Park). This is a postcard with a color-tinted photo. Note the bicycles against the retaining wall at lower left. Here's a wider shot of the park. Here's what's left of that library (many thanks to Petrea). I've always been intrigued by this photo taken in 1920 of Pasadena City Librarian Jeanette Drake (in white) and two unidentified people. That's the Pacific Electric street car barn across the street. Still worried about Swine Flu? Rest easy by reading the latest update here. Who are these women? And what's happening? I'll provide the answer with more info and additional photos on Thursday. Saturday was a busy day in Pasadena! 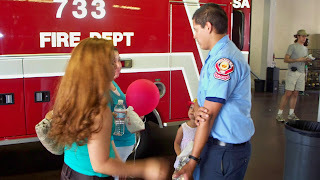 One of the events was Fire Service Day, when all Pasadena fire stations had open houses. 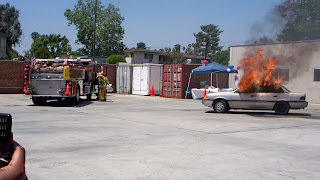 I went to Station #33 on North Lake Avenue where there were also demonstrations throughout the day. 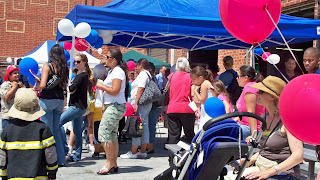 Visitors were welcomed with festive balloons, friendly greetings, food and plenty of educational information. 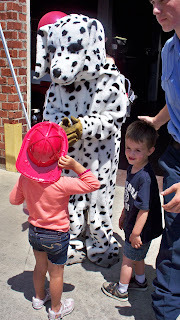 Sparky the firehouse dog greeted each child. Everyone was allowed to get up close -- and inside -- emergency vehicles. These children are in the cab of a big, long ladder truck. 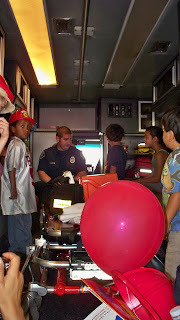 And here are kids in an ambulance with a paramedic. 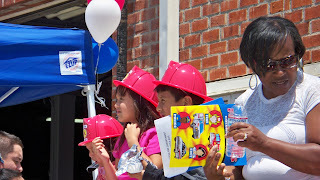 Pasadena Fire Explorers led tours. 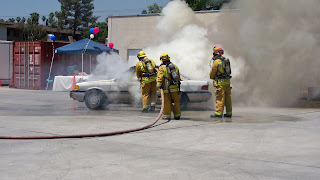 The Explorer program is open to students ages 14 to 18 from local schools who volunteer at fire stations every Saturday. 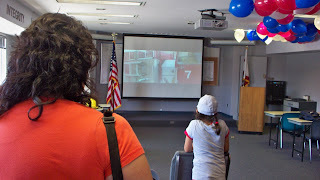 Videos about fire safety were shown. 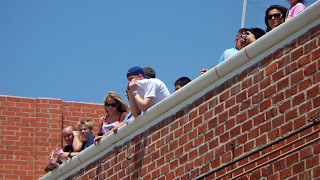 People gathered on the rooftop and on bleachers to see the demonstrations. 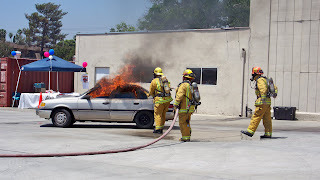 Demonstrations included extinguishing a car fire. The first step was a firefighter lighting the fire (don't try this at home!). Once the car was fully engulfed in flames, a fire engine drove up. 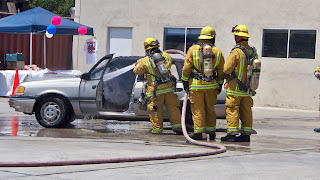 After unrolling the hose, firefighters approached the car and put out the fire. Everybody learned that the engineer stays with the fire engine to monitor the water pressure and perform other duties related to the vehicle. 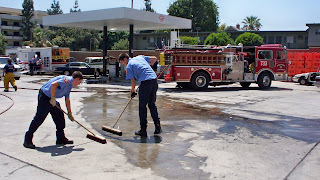 It's a dirty job but somebody's got to do it: Explorers mopping up. 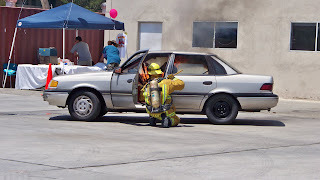 Other demonstrations included extracting a victim from a car using the Jaws of Life. 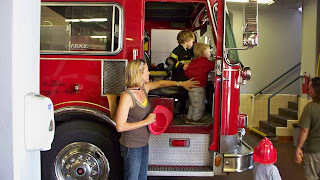 If you couldn't get to your neighborhood fire station on Saturday, you don't have to wait until Fire Service next year to visit your dedicated Pasadena firefighters -- you're welcome to drop by any time. If they're not out on a call, they'll be happy to show you around. On Wednesday I'll post photos from another Saturday event: a celebration at Robinson Park. 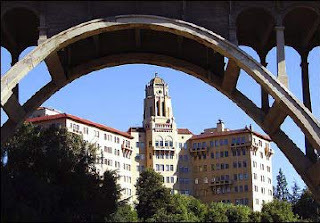 Here's a listing of upcoming free events sponsored by the City of Pasadena. 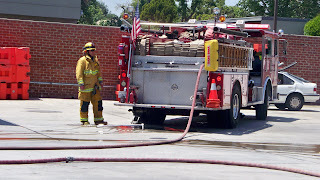 10 a.m. to 4 p.m. – Meet the dedicated men and women of the Pasadena Fire Department during open houses at all fire stations and dramatic demonstrations of fire-fighting and life-saving. 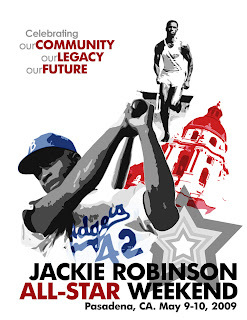 Also Saturday, May 9, also 10 a.m. 4 p.m.– Celebrate with us as we break ground for the expansion of Robinson Park, 1081 N. Fair Oaks Ave., with guest of honor Delano Robinson, widow of late Olympian Mack Robinson and sister-in-law of the late Jackie Robinson. This will be followed by the Black History Festival, which had been postponed from an earlier date. It’s all part of the Jackie Robinson All-Star Weekend. (626) 796-7164, ext. 10. 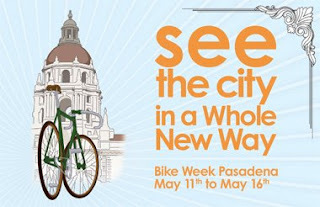 It's Bike Week Pasadena! This annual week-long event educates and motivates people to use bicycles for recreation, commuting to work and getting around town. This year's events include an early evening bike ride with Mayor Bill Bogaard around the Rose Bowl Loop, a documentary film, children's activities, ladies' night and workshops with such titles as "How to Lose Up to 3,000 Pounds in One Day, or the Amazing Car-lite Diet." (323) 478-0060. 8 a.m. – If you own a small business you’ll want to attend the free “Managing Your Business Effectively” workshop in the press box at the Rose Bowl Stadium, 1001 Rose Bowl Dr. It’s part of the Art of Small Business Survival series. Registration is required. (626) 744-4660. 1 p.m. -- This week's free film in the Donald R. Wright Auditorium at Pasadena Central Library, 285 E. Walnut St.. is "Millions," the story of two boys who stumble on a satchel of British pounds just days before that nation switches to the Euro, so they must quickly find a way to spend and share the wealth. Directed by Danny Boyle. (626) 744-4755. In the photo above, a drill is taking place in 1944 in the Civil Defense Center in the basement of Pasadena City Hall. World War II was in full swing, and 1944 was a busy year. Here's a photo of a sign being put up in front of City Hall identifying the building as a shelter site. Note the loudspeakers above it. These were serious times and everyone needed to be at the ready just in case. Victory Park was dedicated as a living memorial to those who fell in World War II. Note that the rose garden is in the shape of a "V." Next time you're in the neighborhood, stop by and take a look around the memorial area, including the dedication plaque at the base of the flag pole. It's really quite nice. There's also a memorial to U.S. Army Staff Sgt. Joe Hayashi, the only Pasadena resident to be awarded the the Medal of Honor (posthumously by President Bill Clinton) for making the ultimate sacrifice during World War II. This photo was taken on Memorial Day so the flag was at half-staff. The Vista del Arroyo Hotel was taken over by the federal government and converted to a U.S. military hospital during World War II. Today it is still owned by the federal government and serves as one of the locations for the U.S. Ninth Circuit Court of Appeals. Two of Pasadena's five sister cities -- Ludwigshafen, Germany, and Mishima, Japan -- were "adopted" post-war so Pasadena could help the cities' civilians get their lives and their communities back to normal. The bombing of Pearl Harbor on Dec. 7, 1941, put the entire west coast of the U.S. on high alert, forcing the cancellation of the Rose Parade on Jan. 1, 1942, as a precaution. The Rose Bowl Game was moved to Duke University (score: Oregon 20, Duke 6). Anyone who has one of these tickets may be sitting on a gold mine because they were useless and had to be reprinted! 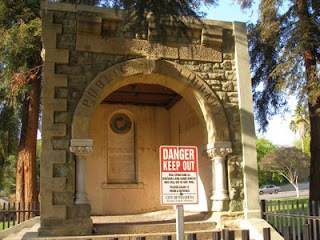 The astronomy program managed by Caltech came to a halt during part of the war because most of the engineers and scientists involved in the program were reassigned to war-related projects. What will the next Mystery History photo be? You'll have to wait until next Tuesday to find out! 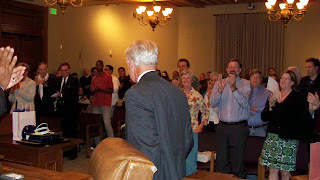 Monday night was the reorganization meeting of the Pasadena City Council. Mayor Bill Bogaard presented a special gift to outgoing District 7 City Councilman Sid Tyler. Councilman Tyler received a standing ovation as he took official leave of his seat and became a constituent. 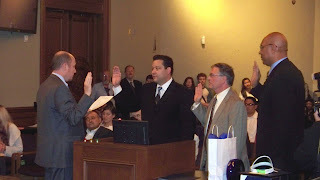 City Clerk Mark Jomsky administered the oath of office to re-elected District 5 Councilman Victor Gordo, new District 7 Councilman Terry Tornek and re-elected District 3 Councilman Chris Holden. Mayor Bogaard presented a gift to Steve Haderlein for his two years of service as vice mayor. Victor Gordo was elected the new vice mayor. 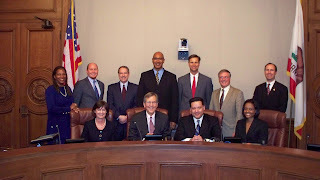 The new Pasadena City Council with the three employees who report directly to council. Front row left to right: Margaret McAustin, Bill Bogaard, Victor Gordo, Jacque Robinson; back row left to right: City Attorney Michele Bagneris, City Clerk Mark Jomsky, Steve Madison, Chris Holden, Steve Haderlein, Terry Tornek, City Manager Michael Beck. Several weeks ago I ran a photo of the all of the current field representatives except one: Jacque McIntyre. 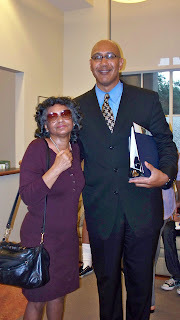 I vowed to get a photo of her, and here she is Monday night with her boss, Chris Holden. I'll have the answer and a little more info on Thursday. Monday night will be City Councilman Sid Tyler's final meeting as the District 7 representative after 12 years of dedicated service. Mid-meeting, he will vacate his seat and Terry Tornek will take the oath of office. There was a nice reception for Mr. Tyler on Thursday evening in the courtyard at Pasadena City Hall. PUSD Board of Education members Ed Honowitz and Scott Phelps chatted it up with Pasadena Police Chief Bernard Melekian. Mayor Bill Bogaard and Tara Goraya (in red), district director for California Senator Carol Liu. Pasadena Fire Chief Dennis Downs gave Mr. Tyler an official lapel pin and cap. Mayor Bogaard took to the microphone and had the crowd in stitches! Those in the front row include Mr. Tyler's wife Betsey Tyler; Larry Wilson, public editor of the Pasadena Star-News; Adam Carter, field representative to California Assemblyman Anthony Portantino; Pasadena City Clerk Mark Jomsky; Pasadena Finance Director Andrew Green; and the guest of honor. Then it was on to official business. City Councilman Steve Madison reminisced about his service on the council with Mr. Tyler. Mayor Bogaard presented a framed commendation. Hey, a guy's got to eat! That's our own Danny Hesse from KPAS with the tongs (he was the audio engineer at the event) and André Coleman from the Pasadena Weekly in the blue shirt. Monday night's meeting will be televised live at 6:30 p.m. on KPAS and via streaming video. I can't take credit for the photos this time; Linda Centell of the Public Affairs Office was the shutterbug!